Location: Montreuil-Bellay, in the Maine-et-Loire departement of France (Pays de la Loire Region). Notes: Château de Montreuil-Bellay is a large medieval building, rebuilt several times and rising in the heart of the walled city of Montreuil-Bellay Anjou in the department of Maine-et-Loire. This is the Duke of Anjou Fulk Nerra who built the first citadel on a Roman settlement in XIIesiècle. He awarded custody to his vassal Berlay Giraud, Giraud became Bellay, and the city takes the name of Montreuil-Bellay. The attachment of the Berlay family to the crown of France led King Philip Augustus in 1208 and King Louis VIII in 1224 to hold their court at Château de Montreuil-Bellay. 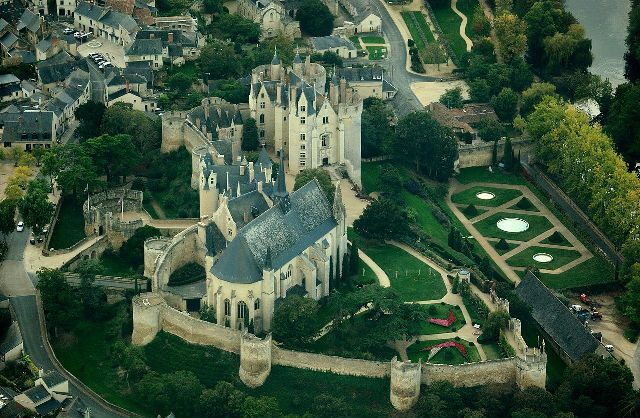 The castle then passed to the family of the house of Melun and House Tancarville during the Hundred Years War. The latter built the walls. Then the castle belongs to the House of Harcourt. Thereafter, it was enlarged with the addition of several towers and a speaker, 650 meters of wall and 13 defense towers, protect the castle, with an entrance of the fortified building, flanked by round and massive towers with Barbican and drawbridge. During the XVesiècle the Renaissance allows the castle to be modernized and airy, new rooms, new kitchen, dining room, large living room, sitting room, bedroom, monumental staircase and construction of the Collegiate Notre Dame with adjoining house to the canons. The old castle takes on the appearance of a "Chateau Neuf". During the French Revolution, the lord of Montreuil-Bellay, Jean Britain Trémoille, remains loyal to King Louis XVI. His castle was requisitioned and turned into a prison for women royalists. After the revolutionary period, the castle became by marriage, property of the family Grandmaison, some of its members were mayors of the city or senator. The castle of Montreuil-Bellay is redesigned and the eleventh, thirteenth, fourteenth and seventeenth centuries, and classified as historical monuments by order of 18 June 1979.